With new water treatment technologies emerging all the time, it can be difficult to identify the ideal solution for your needs. Well-designed industrial water treatment systems can help you meet your production objectives and gain efficiencies along the way. The key is simply taking the time to understand the major factors that determine the best solutions for common water treatment goals. If you’re wondering “how do I choose the best industrial water treatment system technologies for my plant?” then you’ve come to the right place. In this article, we’ll outline the most important factors to consider for each major type of industrial water treatment system. Water quality. You’ll need to consider the quality of your source water as well as the level of quality needed to best support your processes, products, and equipment. Raw water treatment systems can treat source water for a variety of applications, but choosing the best treatment system for your facility is a matter of balancing a few factors, including intake water characteristics, the volume of water needed, and target water quality. Testing and treatability study results. Water treatability testing is the critical first step in identifying an appropriate raw water treatment system. The resulting lab report will help to determine whether your raw water can be treated for your process, and also tell you how it needs to be treated. Plant lifespan. In general, the longer you plan to use a system at your facility, the more rugged the build materials should be. While choosing stainless steel over PVC, for example, can mean higher up-front costs, you’ll more than make up for it by saving on maintenance and replacement costs in the long term. For more factors to consider in evaluating water treatment technologies, check out our article How to Choose the Best Raw Water Treatment System for Your Plant. Feed water quality. Boiler feed water consists of a blend of condensate return water and boiler makeup water. The right treatment strategy for your makeup water will depend upon which impurities are present, and the contaminant tolerance of your specific boiler model. Condensate return water often does not require treatment, though certain technologies can be applied to prevent corrosion due to the presence of dissolved gases. Boiler specifications. Whenever possible, you should use manufacturer specifications to determine what level of quality is needed for your boiler unit. In general, low-pressure boilers (<600 PSI) can safely accept water with some total dissolved solids, whereas high-pressure boilers (>600 PSI) demand reverse osmosis (RO), ion exchange (IX) or other technologies capable of delivering higher quality water. 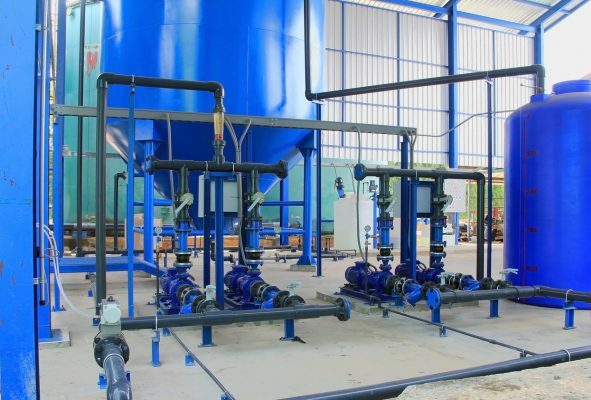 To learn more about selecting the right water treatment system for your needs, check out our article How to Choose the Best Boiler Feed Water Treatment Technologies for Your Plant. Cooling tower specifications. The type of cooling tower (open circulating, once-through, or closed loop), as well as the water quality specifications of your specific equipment, will determine the technologies needed to optimally treat your streams. Feed water characteristics. If you’re looking to protect cooling tower equipment from damage due to scale, corrosion, clogging and other issues, it pays to check the pH, hardness and TDS levels of your source water to ensure that they measure within an acceptable range for your cooling tower equipment. Regulatory requirements. Be sure to check relevant safety and discharge guidelines to be sure that makeup water and blowdown water are compliant. If not, your ideal treatment system may involve treating for biological or other contaminants. Additionally, if your plant struggles with source and/or discharge costs, it may be worthwhile to treat your blowdown water for reuse. For more tips on optimizing your cooling tower operation, see our article How to Increase Your Industrial Cooling Tower Efficiency. Wastewater characterization. Thoroughly assessing the contents of your waste stream(s) will help to narrow your focus to the technologies and systems most capable of meeting your needs. If present in large quantities, contaminants such as grease, oil, suspended solids, metals, and BOD or COD can demand more specialized treatment strategies. Regulatory requirements. A good place to start in deciding how to best treat your wastewater is by consulting applicable discharge requirements set by regulatory agencies and/or your local municipality. The best wastewater treatment systems will not only bring you into compliance with existing discharge guidelines, but can also offer some scalability to ensure that you can adapt as regulations change over time. Treatability study and/or pilot test results. A treatability study is a critical first step in designing a treatment system to suit your needs, as it will give you an understanding of the exact character of your waste stream, and offer some strategies for meeting your objectives. A pilot study, while not strictly necessary, will allow you to test out a selected treatment solution to further optimize the design for your environment. To learn more about identifying an optimal treatment solution, check out our article How to Choose the Best Wastewater Treatment System for Your Plant. Choosing the best industrial water treatment system for your plant is often a complex and highly individualized process. No matter what your water treatment objectives are, it is essential to consult a qualified water treatment specialist who can provide guidance in selecting the right system to meet your goals and budget. An expert can perform treatability and pilot studies to get a better handle on your needs, and can also help you to navigate the many water treatment technologies suitable for your unique process conditions and stream chemistry. Now that you understand some of the factors involved in choosing the best industrial water treatment system for your facility, be sure to read more articles on our blog that delve into these systems a bit deeper. Some of the topics we discuss include how these systems work, how much they cost, and common problems you might encounter, among others.